Which Jabber Clients are affected by this change? What does this mean for the Jabber environment? What methods are available for certificate validation? How do I import certificates into user device certificate stores? This document combines several Cisco resources into a complete, unified how-to guide that is used in order to implement all of the requirements for certificate validation in Cisco Jabber. This is necessary because Cisco Jabber now requires the use of certificate validation in order to establish secure connections with servers. This requirement entails many changes that might be required for user environments. Note: This guide is for on-premise deployments only. There is currently no change required for cloud service deployments, because they are validated against the Public Certificate Authority (CA). When you install or upgrade to any client listed in Table 1, mandatory certificate validation with servers is used for secure connections. Essentially, when Jabber Clients attempt to make a secure connection now, servers present Cisco Jabber with certificates. Cisco Jabber then attempts to validate those certificates against the certificate store of the device. If the client cannot validate the certificate, it prompts you to confirm that you want to accept the certificate, and place it in its Enterprise Trust store. Apply the most recent Service Update (SU) for Cisco Unified Presence (CUP) or Cisco Unified Communications Manager (CUCM) IM and Presence before you begin the certificate signing process. The required certificates apply to all server versions. For example, both CUP Version 8.x and CUCM IM and Presence Version 9.x and later present the client with Extensible Messaging and Presence Protocol (XMPP) and HTTP certificates. Each node in a cluster, subscribers and publishers, runs a Tomcat service and can present the client with an HTTP certificate. Plan to sign the certificates for each node in the cluster. In order to secure Session Initiation Protocol (SIP) signaling between the client and CUCM, use Certification Authority Proxy Function (CAPF) enrollment. There are currently several methods of certification validation that can be used. From one of the machines, accept all of the certificates that are presented to Jabber into the Enterprise Trust Store. In order to verify that the certificates are present, enter the Certmgr.msc command and navigate to Enterprise Trust > Certificates. Open Regedit with a run command and navigate to HKCU > Software > Microsoft > SystemCertificates > trust > Certificates. Right-click and export the Certifates folder in the registry as a .reg file. Push out this file via Group Policy Object (GPO) to all users (or other preferred method). This completes the install of Enterprise Trust Certificates for Jabber, and users are no longer prompted. Note: In the case of a Public CA, the root certificate should already be in the client trust store. Likewise, if you submit CSRs from multiple nodes, public CAs might require that the information is consistent in all CSRs. In order to prevent issues with your CSRs, review the format requirements from the public CA to which you plan to submit the CSRs. Then ensure that the information you enter when you configure your server conforms to the format that the public CA requires. One Certificate Per FQDN: Some public CAs sign only one certificate per fully qualified domain name (FQDN). For example, in order to sign the HTTP and XMPP certificates for a single CUCM IM and Presence node, you might need to submit each CSR to different public CAs. Find and click the Tomcat-Trust Certificate .pem file. Navigate to the file, and rename it with the .cer extension. Open and view this file (MS Windows users). Verify the Issued by field. If it matches the Issued to field, then the certificate is Self-Signed (see the Example). Note: Once you have this CSR file, the process varies based on your environment. Click Upload Certificate/Certificate Chain under Security > Certificate Management In order to re-upload the new signed certificates that were issued to your server. Every server certificate should have an associated root certificate present in the trust store on the user device. Cisco Jabber validates the certificates that servers present against the root certificates in the trust store. 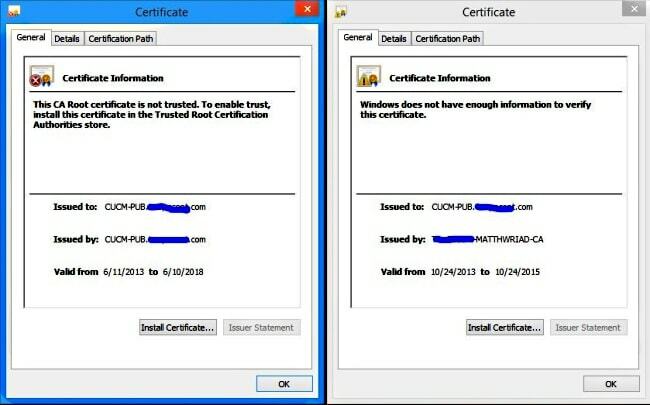 The certificates are signed by a CA that does not already exist in the trust store, such as a private CA. If so, you must import the private CA certificate to the Trusted Root Certification Authorities store. The certificates are self-signed. If so, you must import self-signed certificates to the Enterprise Trust store. Use the Certificate Import Wizard in order to import certificates individually. Deploy certificates to users with a GPO on MS Windows Server. Note: For detailed instructions on how to import certificates, refer to the appropriate MS documentation. A trusted authority has issued the certificate. The identity of the server that presents the certificate matches the identity of the server specified in the certificate. Note: Public CAs generally require a FQDN as the server identity, not an IP address. Note: The Subject CN field can contain a wildcard (*) as the leftmost character; for example, *.cisco.com. Your CUCM, CUP, and Cisco Unity Connection servers might not support wildcard certificates. (Refer to enhancement Cisco bug ID CSCta14114). When a Jabber Client attempts to connect to a server with an IP address, and the server certificate identifies the server with an FQDN, the client cannot identify the server as trusted and prompts the user. So, if your server certificates identify the servers with FQDNs, you must specify the server name as FQDN in many places on your servers. Table 3 lists all of the places that need to specify the server name as it appears in the certificate, whether it is an IP address or a FQDN. **Caution: Make sure that if you change this to FQDN, you can resolve this via DNS or the servers remain in the starting state! The client identifies XMPP certificates with the XMPP domain, rather than with the FQDN. The XMPP certificates must contain the XMPP domain in an identifier field. When the client attempts to connect to the presence server, the presence server provides the XMPP domain to the client. The client can then validate the identity of the presence server against the XMPP certificate. Open the administration interface for your presence server, either the Cisco Unified CM IM and Presence Administration interface or the Cisco Unified Presence Administration interface. Specify the presence server domain in the Domain name for XMPP Server-to-Server Certificate Subject Alternative Name field. After you save this change, you must regenerate the cup-xmpp certificate on the server. Caution: A restart of the XCP Router impacts service. Certificate Validation is now complete!